Baldwin Grand Piano Model R 5’8″ 1975 Ebony $7500 – See Sonny Video Tour! 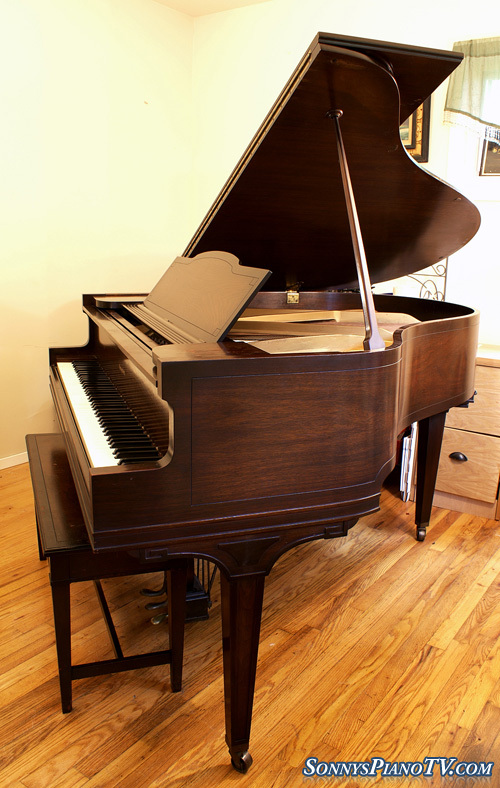 Robust & Elegant Baldwin Grand Piano Model R Ebony 5’8″ 1975. piano has very little playing time. finish just received a French Polish(several coats of hand rubbed padding lacquer applied over original finish gives piano even sheen and a like new look). Action was just regulated so it is very responsive and snappy. Great classic Baldwin grand piano tone and clarity. Warranty and Free LI/NYC Delivery. All else Continental USA only $475. for set up and delivery to your home. Questions call Sonny Direct at 631 475-8046. George Steck Baby Grand, 4’9″ pretty Art Case Inlaid Two Tone Mahogany. Well made American hand-crafted piano from the golden era of piano making in USA 1931. All excellent condition original parts. Furniture excellent. Just received a French Polish. Beautiful original ivories. action just regulated. Piano has rich tone.Very good action response. questions call Sonny Direct at 631 475-8046. Free LI/NYC delivery all else continental USA only $475. Warranty. Sonny describes his Piano Yoga method in details and touches on the healing and therapeutic benefits of playing the piano. Piano playing is for everyone and Sonny’s Piano Yoga method teaches people to get in touch with their musician within by channeling the piano as an extension of themselves. Buying a piano can be a difficult decision with so many different factors involved. Sonny sheds some light on the process of purchasing a piano and whether it’s better to buy new, used, rebuilt, or refurbished pianos. Send Us Your Piano Story! Tell Us Your Piano Story! Help us spread the word about how piano playing is healing, therapeutic, reduces tension & stress, promotes health and a sense of well being. We will post it annonymously on Sonny”s PianoTV.com. Help us encourage others to derive benefits from playing piano by sharing your story about how piano playing has had a positive impact on you or your kids or friends or family members. e-mail us here sonnys.pianos@verizon.net . Sonny’s “Piano Talks” Everyone Can Play The Piano! Sonny talks about how easy it is for everyone to play the piano and demonstrates some ways to get started. Piano playing has numerous healing and therapeutic benefits. It is a form of ultra-sound therapy sending sound vibrations into your body thus relaxing muscles and increasing circulation. It gets your energy flowing and gives results similar to meditation, acupuncture, shitatsu and yoga. It relaxes you physically and mentally, increases circulation, oxygenates you, causes dopamine and beta endorphins to release in the brain giving you a sense of well being and a natural high. It has all sorts of psychological benefits as it helps you express your feelings. Playing the piano improves mental clarity and tests show it even improves math scores in children. We are referring to acoustic pianos more so then electronic pianos as the natural, organic sounds that emanate from an acoustic piano are very different then the electronic frequencies that come from a digital piano. Also being made of metal, wood and cloth it seems to give a similar effect as Doctor Wilhelm Reich’s Orgone Energy Tools. Reich’s orgone accumulators are boxes made of layers of wood, metal and cotton that people sit in and experience a kind of life energy bath that has numerous health benefits. (To learn about Doctor Reich’s energy work, watch the video on Youtube) Also many people report that it seems to improve the feng shui in homes and studios. The healing and therapeutic benefits of having a piano in your home are are endless and today pianos are very affordable from both the used and new markets. Also everyone can play the piano. If you can get around on a computer keyboard then playing the piano is easy in comparison as it only has an easy 8 note/key patterns that keep repeating itself. The growing popularity of the chord method of playing piano has also made playing the piano easy to do for everyone. So play that piano you’ll be amazed at how good you will feel.